On Friday 23 May, Afonso Dhlakama – the long-time leader of the Mozambican National Resistance (Resistência Nacional Moçambicana, or Renamo) – officially announced his intention to run for president in Mozambique’s next presidential election, scheduled for 15 October this year. Renamo’s National Council is expected to meet in June to decide whether to endorse Dhlakama’s fifth bid for the presidency. Dhlakama’s announcement came on the heels of his delayed registration on 8 May to vote in the polls – just a day before the registration deadline. The Mozambican government had extended the original 29 April deadline by 10 days after the National Electoral Commission (NEC) noted that bad weather, logistics and political reasons – particularly insecurity in the Sofala province – had hampered the voter registration process. There are four key reasons why Dhlakama’s much-publicised registration and presidential bid announcement are truly momentous. Firstly, his registration came after he’d spent almost seven months out of the public sphere. Dhlakama had been hiding in the Gorongosa forest since 21 October 2013, when Mozambican government forces stormed Renamo’s Satunjira base camp in response to a series of military attacks, mainly in central Sofala. The rebel-group-turned-opposition-party, Renamo, responded by declaring an end to the General Peace Agreement (GPA) that it had concluded with the ruling Mozambique Liberation Front (Frente de Libertação de Moçambique, or Frelimo) on 4 October 1992, and which had ended the country’s 16-year-long civil war. Secondly, the protracted and often unproductive negotiations between the Frelimo government and Renamo have taken a huge step forward. Renamo alleged that Frelimo’s political and economic governance strategy had excluded both Renamo and the country’s wider citizenry, and subsequently made three demands during the negotiations. The first was a demand for greater representation in state institutions – particularly the national security forces. The second was that the electoral system, including the NEC, be reformed on the grounds that it has allegedly manipulated past electoral processes in favour of Frelimo. The third demand was that Renamo be granted a more equitable share of the country’s natural resources, although the party did not specify how this could be achieved. In turn, the government had demanded the demilitarisation of Renamo. Since the beginning of 2013, dialogue between the government and Renamo had failed to make any progress, which resulted in Renamo boycotting the country’s municipal polls in November 2013. In February this year, Frelimo and Renamo finally reached agreement on one of the key points on their negotiating agenda – electoral reform. The two parties agreed on the amendment of Law No. 6/2013 of 22 February 2013, which regulates the functioning, composition and organisation of the NEC. Under the reform, the central NEC was increased from 13 to 17 members, with Renamo being granted two additional commissioners, bringing its tally to four. Frelimo retained its five-member allocation, and the Democratic Movement of Mozambique (MDM) – the third party represented in Mozambique’s Parliament – kept its solitary appointee. The remaining seven are from the forum of civil society organisations. Although Mozambique’s constitution provides that the NEC is independent and impartial, the appointment of commissioners on the basis of political party representation in Parliament lends the electoral management body to politicisation. The politicisation of the electoral institutions was extended to the provincial and district levels, where the 15-member provincial and district NECs include three commissioners from Frelimo, two from Renamo and one from the MDM. In the central Technical Secretariat for Election Administration (STAE), which provides administrative support to the NEC, the parties appointed 18 members: nine from Frelimo, eight from Renamo and one from MDM. Six members compose the provincial and districts’ STAE: three from Frelimo, two from Renamo and one from MDM. The third reason why Dhlakama’s presidential bid is so important is that it clears up any uncertainty over Renamo’s participation in the October 2014 polls; at least for the moment. Renamo’s boycott of the municipal elections risked its survival as the country’s major opposition party. 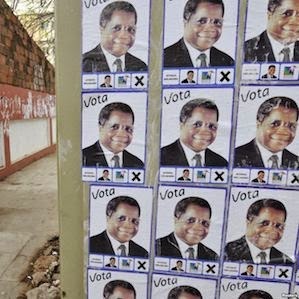 The fast-growing MDM built on its control of two of Mozambique’s largest municipalities – Beira and Quelimane – to emerge from the municipal elections as a stronger opposition force in Mozambican politics. The MDM garnered overwhelming victories in these two municipalities, as well as winning another two, Nampula and Gurué, and performing strongly in areas once regarded as Frelimo strongholds. The party and its charismatic leader, Daviz Simango, will certainly contend strongly in the forthcoming general elections – particularly against a backdrop of a politically active urban population that holds the ruling Frelimo party in contempt. Dhlakama and Renamo have their work cut out as other leading contenders, while Filipe Nyussi of the ruling Frelimo party and Simango of the MDM will have had a head start. Dhlakama, although only just emerging from hiding, will have to hit the campaign trail soon. Fourth, it seems that Renamo has decided to compete against the government with ballots instead of bullets. This could signal the party’s amenability to the declaration of a ceasefire. Critics believe that Renamo has used its armed cadres as a bargaining chip in negotiations with the government, and that it would be reluctant to disarm and participate in purely peaceful political activities. However, there is hope in the fact that warmongering could alienate the party from the Mozambican electorate when its parliamentarians are eager to retain their seats at the forthcoming polls. As Suzanne van Hooff, a security analyst noted, Renamo would have to make the hard choice of suppressing aspirations to gain senior positions in the army and the police force, before it can gain widespread support amongst the Mozambican people. It is therefore vital that the Frelimo government and Renamo continue negotiations with a sincere resolve to reach agreement on fundamental outstanding issues – particularly a ceasefire and the disarmament of Renamo insurgents – to create conducive conditions for peaceful elections. The Frelimo government could effectively implement, monitor and evaluate mechanisms to address the needs and expectations of former combatants, 20 years after the war. This includes identifying and registering genuine ex-combatants, including newly disarmed and demobilised Renamo insurgents, so that they can access compensation in the form of pensions. This could help create conditions for Mozambicans – including Dhlakama and Renamo – to participate freely in a peaceful electoral process. Encouragingly, the combination of factors that led to the parties’ consensus around electoral reform still exists. These include Renamo’s diminished capacity to wage sustained guerrilla warfare; the Frelimo government’s concern about the adverse economic consequences of continued instability; and pressure from civil society and the media. These are the factors that can truly promote the parties’ engagement in sincere peace dialogue. Gwinyayi Dzinesa, Senior Researcher, Conflict Prevention and Risk Analysis Division, ISS Pretoria and Paulo Wache, Head of the Department of Foreign Policy, Centro de Estudos Estratégicos e Internacionais Maputo, Mozambique.